They aren’t exactly braised. They aren’t exactly roasted. They’re somewhere in between…they’re broasted. And they are exactly how I’m cooking up six pounds of carrots this weekend. I know that sounds like a whole hell of a lot but between a carrot loving toddler, the base for a carrot soup, and a pot luck contribution, I think it might not be enough. BAH Note: I’m a wimp when it comes to high heat roasting. It always ends up badly for me. If you are braver than I am, try using Cooking Light’s recommended temp of 425 degrees for 15 minutes. Me, I take a lower and slower approach. Heat oven to 375 degrees and line a sheet pan with aluminum foil. 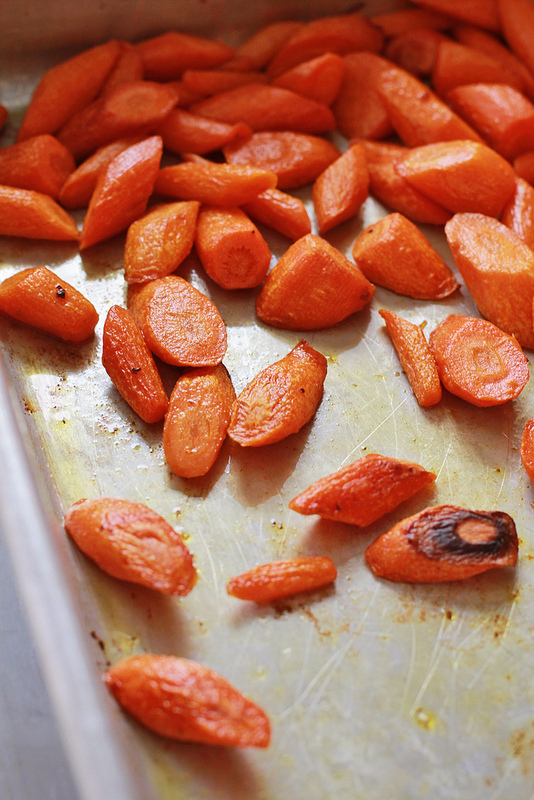 Combine the carrots, butter, olive oil, and salt on the baking sheet and toss to fully coat the carrots. Bake for 30 to 40 minutes or until the carrots reach your desired tenderness.